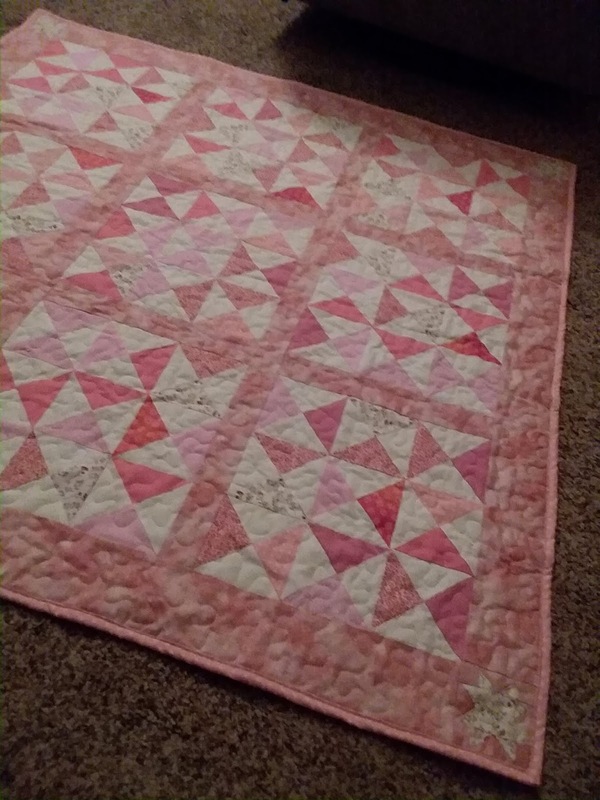 This is my first commissioned quilt. 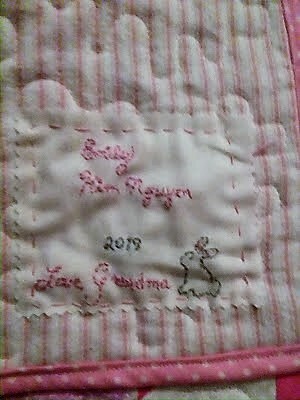 It is for baby Emily from her Grandma. 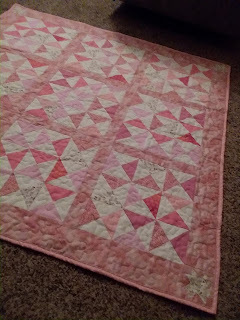 Half square triangles sewn together randomly with sashing and stars in the corners. 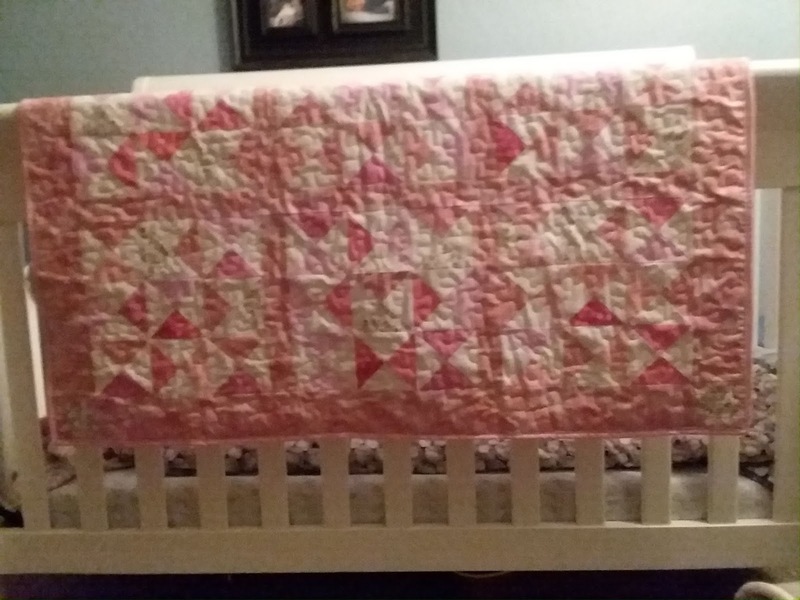 Similar to the one I made my granddaughter but unique. I'm going to embroider in the middle name and birth date when they know. This is for baby Joseph Mekhei, named for his dad, but his middle name is the Hawaiian version. I made these baby quilts for my work friend's (who is retiring) little granddaughters, Story Katrina and Navy Jane. She will move out of the area and I won't see her often. 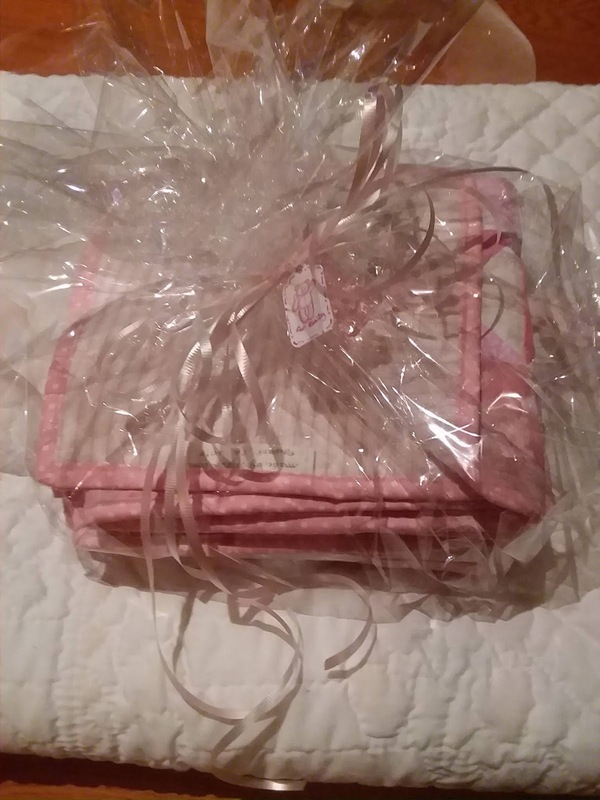 I will miss her! Prairie point border on one and the other has a wavy border. I'm really happy to try something new! 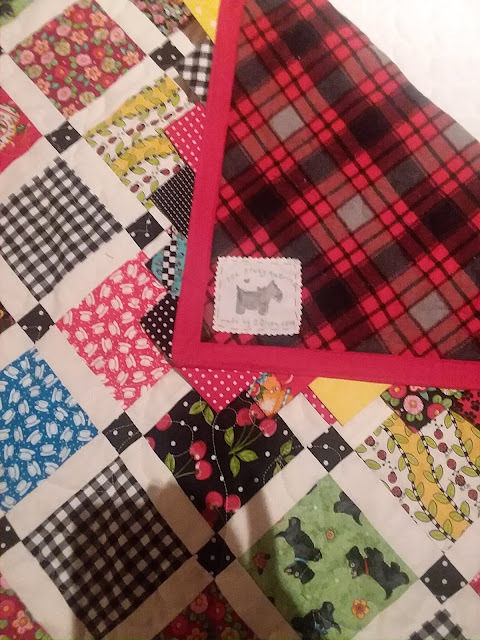 I quilted them with a scottie dog and hearts design I created and added scottie dog labels. 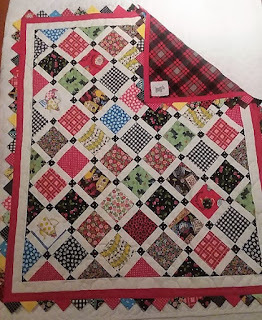 Unfortunately it's difficult to see the quilting. Long ago when I started these blocks I noted some cutting instructions below. The prairie points are 3 1/2" squares folded diagonally twice. 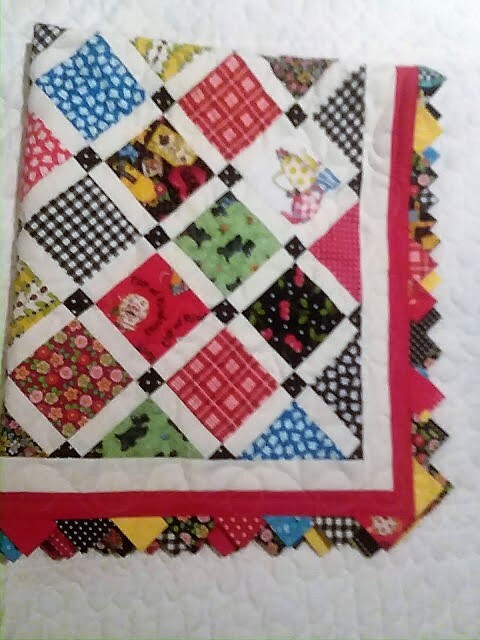 I sewed them on facing into the quilt at the same time I applied the red binding and when I turned them out and pressed them, they looked great! 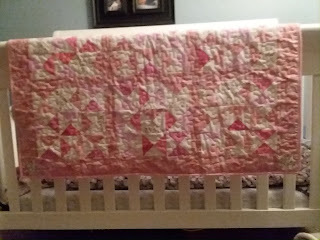 Then I just had to sew a stay stitch on the front and sew the binding down in back. 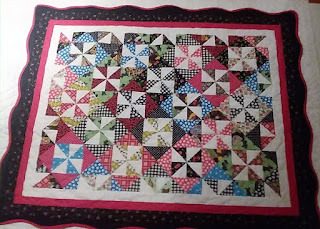 When I make this border again, I will not cut the binding 2 1/2", but will cut it 1 5/8"
Pinwheels: 4 7/8" squares (place print and white background fabrics right sides together, sew around perimeter with 1/4" seam, cut diagonally twice to yield 4 half square triangles (HSTs). 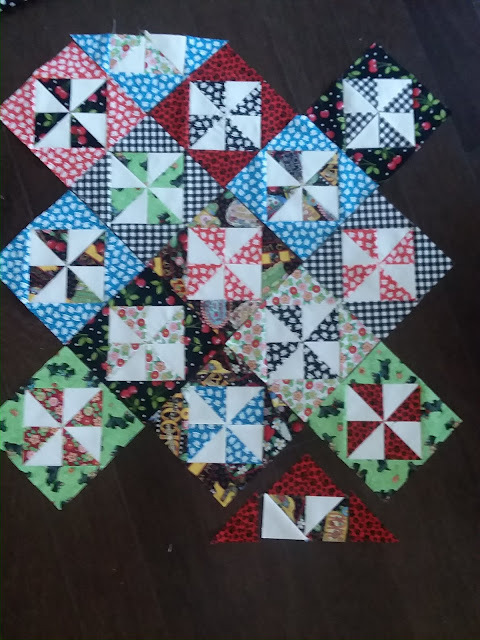 Square up HSTs to 3" and sew together into pinwheel formation. 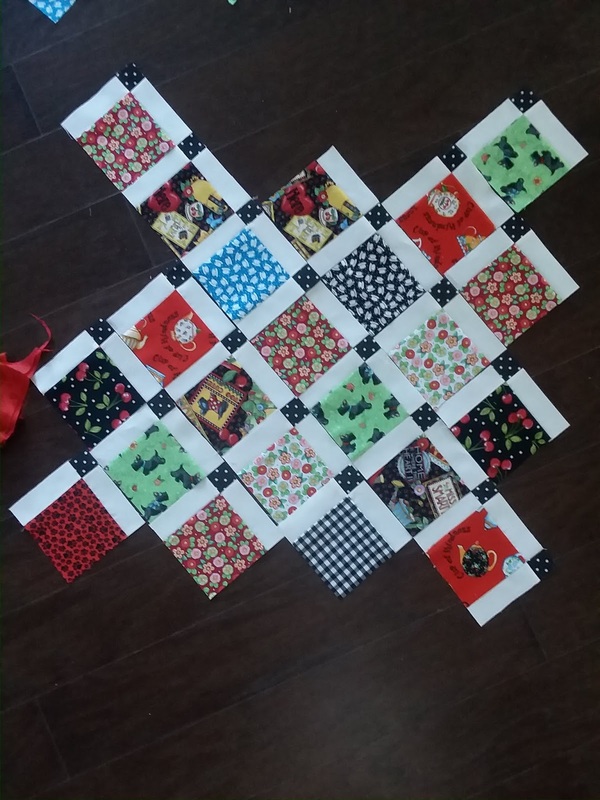 Triangle borders: Cut 6 1/4" square and cute diagonally twice. My goodness, you’ve been a busy girl! 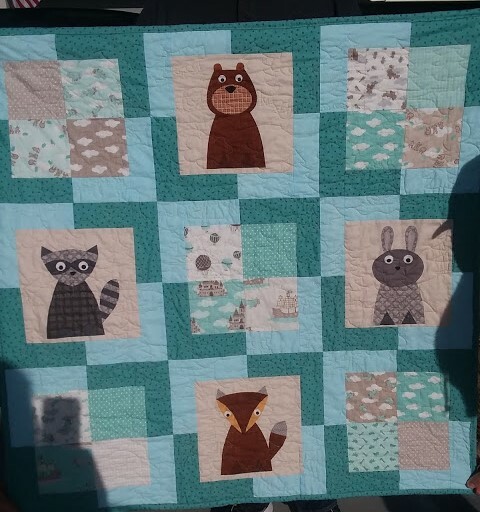 And look at all those precious baby quilts! Such a motivating post.